Obviously, the best source for nIR light is the sun, just as for visible light. Luckily, most man-made lights also emit IR light. 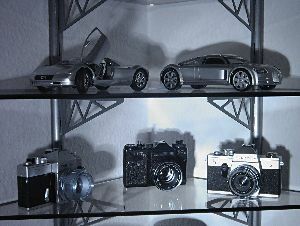 It is also noteworthy that most flashes emit enough IR light to be useful. I just tried something different. 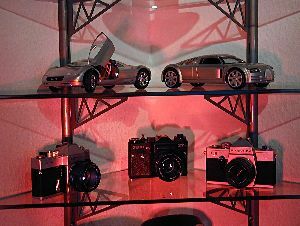 Using a heat lamp which you can cheaply get in many stores, I additionally illuminated my display of models and old SLRs. Other light sources were halogen lamps on the ceiling. Visible light with my 2020. IR with my 2040IR and 715nm IR pass filter. Note the bluish cast on of those lenses. It is the same effect as on my bike. What is to say about Focussing? If the camera uses an autofocus (AF) sensor that does not look through the lens (non-TTL), it will not pick up the effect of the infrared pass filter. Or the camera might have an AF sensor that has another IR-sensitivity than the main capture device, like many SLR and dSLR cameras do. Here is an illustration how the AF system of most SLRs work: www.leongoodman.com/d70focus.html. But even with those cameras you can usually achieve proper focussing. On compact cameras, use the LCD to do manual focus or if that fails, set focus to one or two steps "in front of" infinity (you cannot use the same hyperfocal distance as with visible light) and hope that the large DOF helps you. On SLRs, do manual focus and line up the red dot or stripe on your lens with the distance readings. More on dSLRs in the following paragraphs. Still, with the ever-increasing strictness of internal IR cut-filters, exposure times go up. This not only makes a tripod essential, but it is clear that cameras have problems focussing when it is dark. And "focus assist lights" will not help you much, once you have the IR pass filter on. So, many focus problems are just caused by the scene being too dark for the camera to focus precisely. As said before, dSLRs (and AF aSLRs) use a separate sensor for AF. If that sensor is IR sensitive (as it usually is), AF in IR is actually possible. Mike, Jonas, Jan and others from the dpreview forum, myself and reader Ken Cho have found that AF on the Pentax *ist DS to K100D dSLRs works well enough in IR with a mild 715/720nm filter. If you use manual lenses with these cameras, you can use the "digital rangefinder" function Pentax added: The Focus Confirmation light will light up if that point is in focus. On dSLR cameras that do not provide this focus assist, you have to focus as you used to with manual focus film SLRs: Focus in visible light, mount the IR pass filter, then adjust IR focus by aligning the distance you read from the focused lens with the IR mark on the lens. Modern lenses often do no longer have that IR mark, then you have to guesstimate the focus adjustment and maybe stop a bit down to increase depth of field. "How common is it to be able to get sharp focus on IR shots when you zoom all the way in?" IMO, the usual problem is not IR, but that the scene becomes too dark for the camera. Infinity of IR light is "in front of" infinity for visible light, so it's technically possible to get exact focus to infinity for all focal lengths. Things start to get different when the camera does not rely on contrast-detection (or whatever) straight from the CCD but instead uses a dedicated AF sensor alone or in conjunction with the CCD method. These dedicated sensors are usually less IR sensitive and thus cause troubles - dSLRs often suffer from this. Also, if it is a non-TTL AF sensor, the camera will have a hard time finding focus for IR ;) For cameras with hybrid AF systems, synchronizing the TTL AF sensor that sees only IR and the external non-TTL sensor that works by triangulation and is calibrated for visible light is just impossible. Any focus problem is likely to show more at long focal lengths as the Depth of Field gets shallower.